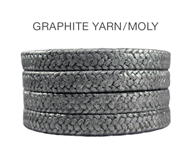 High purity, high strength graphite filament yarn treated with fine graphite powder to seal individual fibers. Surface coated with molybdenum disulfide. Low friction – runs cooler, lasts longer – reduce flush water (greatly reduce product dilution). Non-Abrasive – Sleeves last longer. Maximize equipment reliability and performance. Dissipates heat better than conventional compression packing materials. Increase MTBR – mean time between repair – less sleeve damage. Dimensionally stable fiber (less volume loss). High profile demanding applications; high speed rotating equipment to 5,000+ fpm – specially suited for refiners, makeup liquor pumps, Boiler feed pumps, condensate, end rings for Flexible Graphite die formed packing sets. Molybdenum disulphide surface coating extremely chemical and thermally stable. Recommend installation where the sleeve is in new condition.